Picture this: June 19, 1996. It was a dark and stormy night. As I trudged along from the house toward the barn, a mournful howl sounded from somewhere in the misty distance. It was my mother. Some #%@*^ Friesian horse had stepped on her bad foot. Again. Ignoring my own fatigue -- it was 2:00 am. 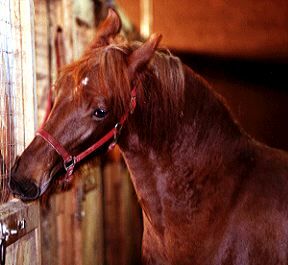 -- l sprinted the last few yards to the closed barn door and let myself in. Mom lay curled up on the concrete floor, clutching her foot and sobbing softly. Upon observing this pitiable sight, I did what had to be done. Returning minutes later from the "facilities" in the tack room, I was pleased to see that Mom had recovered from her injury and was now hobbling around and inexplicably and unjustly cursing me. After all, it's not like I mashed her foot. Later, when Mom's small vocabulary of rude words finally ran out, we proceeded to the task that had forced us up from our comfy beds -- taking the temperature of a 3 week-old filly suffering from a nasty bout of temperature-spiking flu. Fortunately, the sick filly, Maeve, behaved angelically throughout the procedure and turned out to be just fine. Accordingly, Mom and I quickly congratulated each other on this improvement and headed back to bed. However, on her way out of the barn, Mom halted her battered, limping progress long enough to ask me to check on her favorite mare, Abracadabra, who was then hugely pregnant by Laes with her first foaI. Now, at this point, you should be aware that Abra is a deeply horrible Friesian horse. From the very moment of her hatching, she has been spoiled, selfish, willful, short-tempered, and twice as much work as any of our other 5 broodmares. Strangely enough, Mom tells me she loves Abra so much because the mare reminds her of me. I personally don't see the resemblance at all, and it makes me worry. I think Mom's mind is going. Anyway, back to the story. With the absolute minimum of dirty looks, I heroically marched over to Abra's stall and looked in, as per Mom's request. Standing quietly, Abra returned my gaze, flicked her tail, and .... and ....there was something white protruding from her chubby backside !!! Casually turning to Mom, I called over to her that Abra was foaling. Unfortunately, unused to the sight of her youngest daughter remaining calm in a crisis, Mom did not take me seriously at first. She laughed quietly and started to leave the barn. I gently corrected her misapprehension. "THE #%@*^ HORSE IS HAVING HER BABY RIGHT NOW !" This brief announcement had a satisfyingly electric effect on Mom. She took a peek into the stall and then bolted for the barn phone, shouting for me to get in there with the #%@*^ horse. As I entered the stall, Abra dropped down with a thump and pushed out her foal. I was appalled. Still wrapped within the fetal membrane, an unnaturally pale form lay dead still in the straw. Still busy phoning the vet, Mom yelled over and demanded a progress report on the birth. This was not going to be easy. As tact has never been my strong point, I replied, "That it's dead and rotting." "WHAT!!!!" Mom knows how to get to the heart of any matter. "Well, it looks all blue and stiff and cold." "Did you open the sack yet and check?" "No. It looks awful and will probably smell worse." Peeling the clinging, filmy membrane away from the foal's mouth and nose, I discovered two things simultaneously. First off, the foal was very much alive and, by its expression, highly offended that I took so long to do my job. Second, it wasn't blue and cold at all. Instead, it was red and warm. Mom broke the spell by joining me in the stall. Her next words had a certain comforting logic, "I told you it wasn't dead." That was just over five months ago, and the filly, subsequently named Obizuth, is now even redder. Also, Mom's foot still hurts. Blood-typing proved that Obizuth is indeed a purebred Friesian, despite her unorthodox hair color. 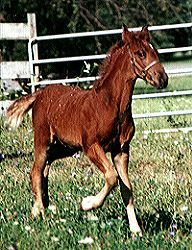 The FHANA registry finally decided that she could be registered in the foal book registry but that her offspring would be unregisterable. 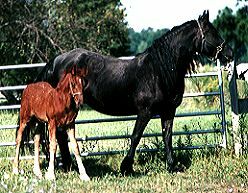 This means that desite being one of the few chesnut Friesians (last count a grand total of 4) in the world, her monetary value is slight. That's all right, she NOT for sale anyway. Tragically, Obizuth's dam Abracadabra died suddenly of an aneurism last year but Obizuth herself is doing very well indeed. Back to Friesian Facts or Waltz.net. This page is under construction. It was created on January 12 and last modified on January 12, 1998.